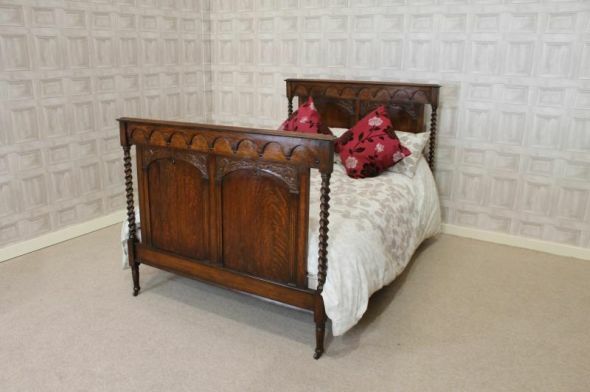 This barley twist bed is an elegant piece of Edwardian bedroom furniture. This beautiful circa 1910 solid English oak carved barley twist bed features an elegant headboard and matching footboard. The bed comes complete with a newly made pine bed base which is supported by robust side irons. The bed is in lovely condition for its age. There is a moderate amount of wear and tear due to constant use, but this is still an elegant piece of furniture to complement any existing Edwardian oak bedroom furniture.